Less than a decade ago when you heard the word “chia,” you probably didn’t think about it as a food. It probably made you think one thing: Chia Pet. In more recent years we are learning that chia seeds contain many nutrients and make an excellent addition to your diet. So, how well do you know chia? Chia is believed to have been first used by the Aztecs as early as 3500 BC and was one of the main components of their diets. According to the people at Chiatrition, the Aztecs would consume chia as food and mix it with other foods. They would also mix it in water and drink it as a beverage, grind it into flour, included it in medicines, and press it for oil. The chia flour could be stored for several years and was easily carried on long trips. The Aztecs would also offer chia to the gods during their religious ceremonies. When the Spanish conquistadors came to the new land they repressed the natives quashed their traditions. The conquistadors spurned chia, as well as quinoa and amaranth, as “food for the Indians” and forbade its consumption and growth. Chia survived only in a small area of Mexico for the next 500 years. It was in the early 1990’s that a group of US and South American agriculturalists, nutritionists, and scientists began to work together on the commercial production of chia in Argentina. They collaborated in the hope of rediscovering the lost nutritional plants of the Aztec tradition and civilization. Chia plants require a long and dry growing season to mature. Today chia is grown in Argentina, Bolivia, Mexico, Peru, and Australia. There is also some production in the United States. Chia seeds are most commonly consumed in Mexico and the United States, but they are not overly common in Europe. 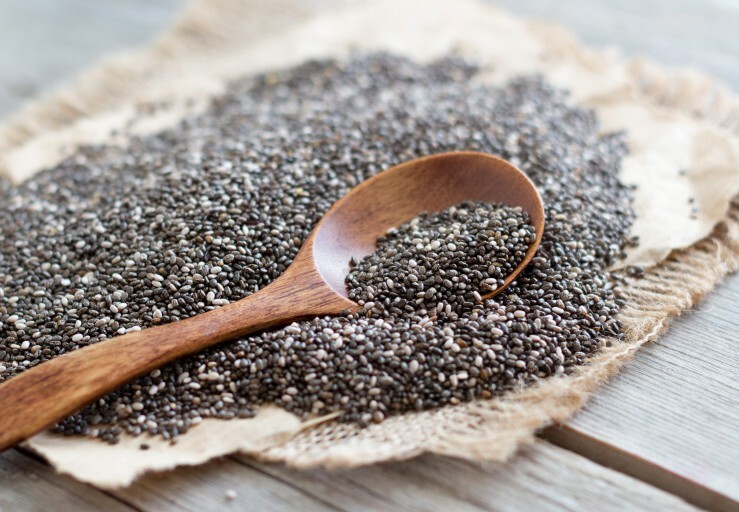 Ancient Grains for Modern Nutrition states that chia seeds have earned the title of “superfood,” as they are known to have some amazing health benefits. • Chia seeds are gluten free. • Chia builds strong bones. Chia contains four times the amount of calcium as milk, as well as the trace mineral boron. This catalyzes calcium absorption and usage throughout the body. • Chia is rich in Omega-3s. Its oil is 63% Omega-3, greater than flaxseed oil (58%), and menhaden fish oil (29%). The American Heart Association says that Omega-3s can normalize bad blood pressure and bad cholesterol levels and promote a healthy heart and blood vessels. • The seeds are a good source of vitamin B, with a higher niacin content than corn, rice, and soy. Its thiamine and riboflavin content is similar corn and rice. • Chia seeds are a great source of calcium, phosphorus, magnesium, potassium, iron, zinc, and copper. • It is great for the digestive system. Chia seeds are 40% fiber. They have a higher concentration of soluble fiber (27%) than wheat, oats, and flax. • Studies show that chia can help diabetics to control both their blood sugars and blood pressure. This is attributed to the fact that when digested in a gel form, the gel slows the breakdown of carbohydrates, allowing the body to process sugars more gradually. Chia seeds are small and oval in shape. They are mottle-colored with black, brown, gray, and white. Chia seeds are hydrophilic, they absorb nearly 12 times their weight in liquid when soaked. While they are soaking the seeds develop a sticky, gel-like coating that gives chia based beverages a unique texture. Chia seeds are most commonly consumed as chia gel. This allows the seeds to be easily digested and the nutrients better absorbed. Consuming in gel form will also expand the life of your chia, as a single tablespoon of chia seeds is equal to nine tablespoons of chia gel. Mix together and let soak for at least 10 minutes then stir. This gel can be stored for around two to three weeks in the refrigerator. One to two tablespoons of gel per day will allow you to achieve the many benefits of chia. Chia gel can be added to moist food sources like yoghurt, dips, smoothies, sauces, salad dressings, mashed potatoes etc. The seeds do not have a distinct flavor so they can be added, unnoticed, to almost anything. You can also eat chia dry – it can be ground or the whole seed. Like sunflower seeds, they are good sprinkled on a salad. • Chia seeds have more Omega-3 fatty acids than any other plant food. • In Aztec mythology it is said that chia seed came from the nose of the maize god, Cinteotl. • Chia Fresca, the popular Mexican drink, is made by soaking chia seeds in water until they become gelatinous and then adding sugar and lemon or lime juice. • The chia plant is a member of the mint family. There are currently no chia recipes on Fill Your Plate, but we have included one for you to try! In a medium bowl, gently whisk the almond milk, yogurt, 2 tablespoons maple syrup, the vanilla and 1/8 teaspoon salt until just blended. Whisk in the chia seeds; let stand 30 minutes. Stir to distribute the seeds if they have settled. Cover and refrigerate overnight. The next day, in a medium bowl, toss the berries with the remaining 4 teaspoons maple syrup. Mix in the almonds. Spoon the pudding into 4 bowls or glasses; mound the berry mixture on top and serve. This entry was posted in Food Facts, Fun Food Facts, Healthy Eating and tagged chia, chia facts, chia seeds, food facts. Bookmark the permalink.